Peter Ubel, MD, is a physician and behavioral scientist. He is the Madge and Dennis T. McLawhorn University Professor of Business, Public Policy and Medicine at Duke University, an alumnus of the Robert Wood Johnson Foundation (RWJF) Generalist Physician Faculty Scholar program, and the recipient of an RWJF Investigator Award in Health Policy Research. I come from an ardent Republican family. Suspicion of government, you could say, runs in my genes. No surprise then that the first time my parents and siblings heard about Obama’s individual health insurance mandate, they were against it. I live in a college town. Suspicion of Republicans, you could say, lurks in my ‘hood. No surprise then that in the 1990’s, when the Republicans were proposing alternatives to President Clinton’s health care reform efforts, people in my neighborhood were against it. Funny thing though: that Republican alternative was based, in part, on the idea of an individual health insurance mandate, an idea my current Chapel Hill neighbors largely support. That’s right, in a previous life the individual mandate was a Republican idea and now, in most people’s minds, it is a Democratic one. Indeed, mere mention of the policy elicits strong emotion from people, even though public opinion polls have consistently shown that the majority of Americans do not understand how the mandate works, or why both parties have, at one time or another, viewed it as a good idea. 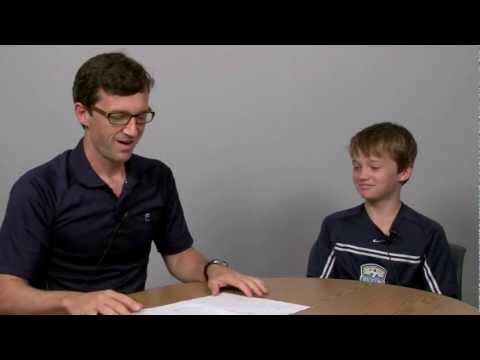 So I decided to make a video with my twelve-year-old son, an unscripted discussion about health insurance (what twelve-year-old wouldn’t want to have that conversation? ), to see how easily a middle schooler could understand the rationale for incentivizing people to buy health insurance. I think you will agree, if you get a chance to look at the video, that the mandate is a pretty straightforward idea. Love it or hate it, people need to understand it, otherwise they will perceive laws and regulations solely through political eyes. All too often, people view public policy like spectator sports. They root for the home team, regardless of who is playing for it or how they are playing the game. Trade a few players a year back and forth between the Red Sox and the Yankees, and pretty soon New Yorkers will be rooting for a bunch of players they used to hate. And Boston fans will be finding that that former Yankee, who they used to think was outrageously arrogant, is now simply brimming with appropriate confidence. I teach about the U.S. health care system to Duke undergraduates, and a major goal of my pedagogy is to help them put aside their partisan biases (and we all have those!) to understand how policies really work. I made this video with my son as part of an effort to bring that same pedagogical approach to a broader public. Maybe if we all turn off Fox News and MSNBC for a while, and view the world through the eyes of a twelve-year-old, we will have a better understanding of the way our health care system actually works. Peter Ubel’s research explores controversial issues about the role of values and preferences in health care decision making, from decisions at the bedside to policy decisions. His books include Pricing Life (MIT Press 2000) and Free Market Madness (Harvard Business Press, 2009). His newest book, Critical Decisions (HarperCollins), is coming out in September of 2012, and explores the challenges of shared decision making between doctors and patients. You can find his blogs and other information at http://www.peterubel.com/.